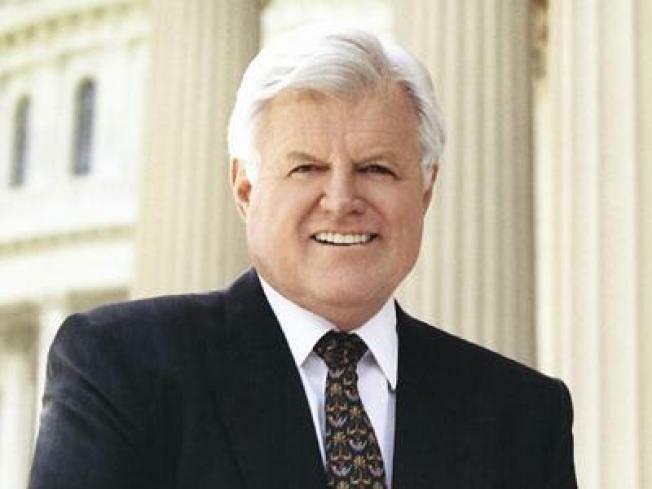 Sen. Ted Kennedy was diagnosed with brain cancer after suffering a seizure in May. A statement issued by his office attributed the episode to a change in medications. He returned to his home at 8 p.m., about three hours after going to the hospital. Sen. John Kerry said his fellow Massachusetts Democrat was well and hoped to be home to watch the evening's presidential debate between John McCain and Barack Obama. The statement from Kennedy's office said, "Doctors believe the incident was triggered by a change in medication. Senator Kennedy will return home tonight and looks forward to watching the debate." His office confirmed he returned home about 8 p.m.
A 911 call from the Kennedy compound in Hyannis Port came around 5 p.m. EDT Friday, said Barnstable Police Sgt. Ben Baxter. Kennedy was taken to Cape Cod Hospital and was "alert and responsive" during the trip, Baxter said. On Tuesday, Kennedy told reporters visiting his Hyannis Port home that he was actively following the presidential race. "I'm going to be following it particularly next Friday," the senator said with a laugh. Kennedy, 76, had a seizure in May and underwent surgery in June for a malignant brain tumor. After undergoing six weeks of chemotherapy and radiation treatment, he has been steadily increasing his public activity. On Tuesday, Kennedy received Chilean President Michelle Bachelet in his first public appearance since he gave a surprise speech in late August at the Democratic National Convention. Bachelet presented the senator with her country's highest civilian award — the Order to the Merit of Chile — in recognition of his opposition to the country's 1973 government overthrow and his work to cut off military aid to dictator Augusto Pinochet. At the meeting, the senator stumbled momentarily as he tried to walk on the thick grass, but he quickly regained his balance. While he eschewed questions from reporters, he departed from his prepared text to point out landmarks to Bachelet and tell an impromptu story about a friend in the crowd. "There's a wonderful relationship between our family and the sea that hoes back a long time," Kennedy said as he pointed to Nantucket Sound and the mooring where his schooner "Mya" rocked in the waves. In early September, Kennedy announced he would not return to the Senate until January, but has since held videoconferences with his staff and members of the Senate Committee on Health, Education, Labor and Pensions, which he leads.